The WOW topic 'It's a Family Tradition' was supposed to bring out our wonderful and quirky traditions. A big thank you to all those who took up the challenge and blogged about the topic. 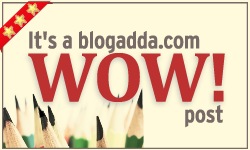 Here are the wonderful blog posts that made it to the final WOW shortlist. Congratulations and WOW badge mubarak ho!